So, not craft or kirakollection related – but everything with me is related to food. I love to eat, and since I’ve recently hit my 30’s, I’ve noticed that my metabolism sure aint what it used to be. I like to use the excuse of having a child, although that was 4 years ago, it’s still valid isn’t it? Anyhow, there is a slim-down contest at work, where the first month’s prize was $100, second month prize $100, third month prize (this month) is $500, and then a prize of $100 for maintaining in January. I coud really use that $500 – especially with Christmas creeping up faster than I’d like! I’d like to lose at least 10 pounds, but with my love of good food, it’s hard. I googled so many diets, detox, soup, vegetable and my goodness, who knows where to start!? So I’ve just started watching. I have one reasonable meal, and the other meals are either fruit and/or vegetables. I don’t have anything against vegetables, I enjoy most of them, it’s just the whole preparing part – and the return on your investment – I’d much rather put my efforts into some hamburger patties, or bacon and eggs, you get the point. Anyways, I’ve started yesterday, and this morning before work I went and got all my vegs to give stir fry a try. 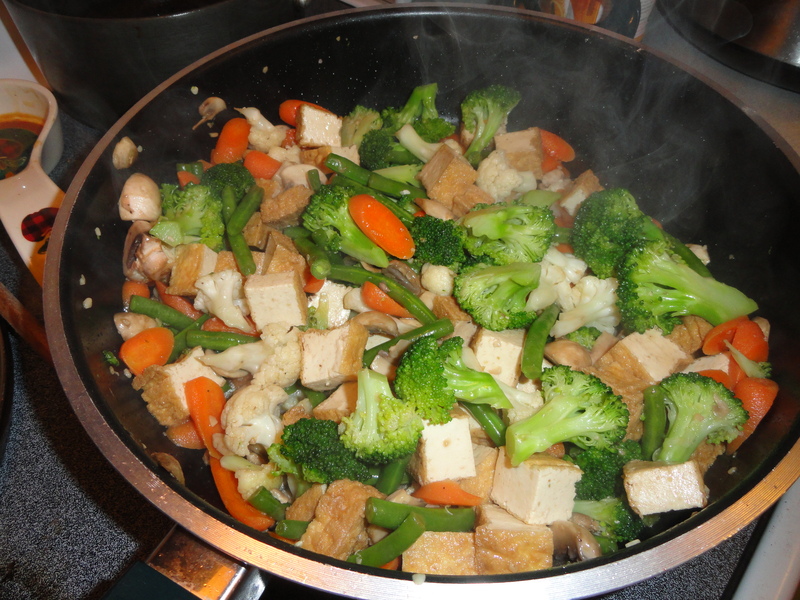 Brocolli, cauliflower, string beans, mushrooms, carrots and fried tofu. Fried up some garlic (love garlic) in some olive oil, then threw in the hard veggies. After a bit I tossed in the tofu and mushrooms. Added a little bit of teriyaki sauce, pepper and voila! Dinner! It took me maybe 15 minutes to chop everything up into chunks, and like another 10 to actually cook the food. AND – IT’S GOOD! I’m not going to die! Anways – here’s my dinner for tonight. Last night it was just a green salad, so this is a step up.